I haven't done one of these in a little while, so it's time for a review of another obscure game that hardly anyone but me has heard of. This time, Realms of the Unknown, a strange little game that came out in 1991. Written by Timothy A. Dohrer and Gerry Evenwel III, they claim that it had been developed and playtested over the previous 10 years, so I imagine that it was first played in 1980 or so. In their introductory notes, they claim that hundreds of people had played the game, and that for all that time the rules were never written down. I can certainly believe that, but it does seem to indicate that a number of the more complex parts of the game (such as the more advanced mass combat rules) must have been written specifically for the published game. Anyway, the idea of the game is that the players each represent a single city or other population group (I think of them as clans or small tribes). It's never spelled out explicitly, but I imagine that the players specifically represent the gestalt of all the rulers and other influential people of the population group. 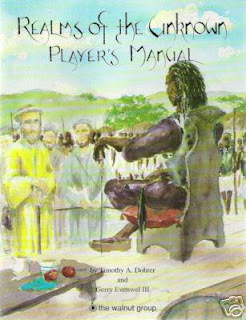 In the basic game, each player is given a sheet which details the various resources to which they have access, such as population (divided initially into "men" and "protected population", 35% the former and 65% the latter), food, raw materials such as animals or minerals, and manufactured goods such as weapons or tools. These are the resources with which the player will set out to… do whatever he likes. There are no turns as such in the game, though time is tracked. The main suggestion is that time should pass at a rate related to real time, though at an accelerated rate. The baseline suggestion is that one week passes in the game for every 24 hour day in the real world. At any time, a player can send an Order to the Referee. Orders are of several types, though each is really just a codification of the sorts of things that can be attempted. There are Exploration Orders, Production Orders, and General Orders (which comprise everything else). An Exploration Order might be, "Send 10 men, each armed with a bow and 40 arrows, on horseback, to the east. They will carry enough food for a two-month journey. They will travel for four weeks and then return to [the City] with the information they have gathered. Their assignment is to map the area and look for any interesting resources (animals, metals, or natural). In particular, look for iron in the foothills." A Production Order is simpler, assigning some population to produce an item or items, giving the items requested, the resources required, the population assigned, and the time it should take. For instance, "100 swords, 20 iron units, 10 men, 4 weeks." A General Order might be, "Have 50 women from the Protected Population put in charge of civil defense in [the City]. They will be referred to as civil officers in times of emergency." An Order can also be defined as a "Standing Order", which will stay in effect until countermanded (though this is probably not recommended for most Production Orders). Most Orders are adjudicated by the Referee as she prefers, but combat is covered by a mass combat system. In this, each soldier is given a basic rating of 1 (or 0.2 if Protected Population). Training and equipment multiply this number by a varying amount, so that a soldier with "Level A" training (the first level after "Untrained") has a modifier of 2.0, a Longsword has a modifier of 1.5, a Wooden Shield 0.10, and Chain Mail 1.25. The equipment values are added together, increased by 1, and multiplied by the basic level given by the type of population and level of training (it is, in fact, possible to train Protected Population as soldiers). In our example, the basic training value of 2.0 would be multiplied by 1+1.5+0.1+1.25=3.85, giving a final value per soldier of 7.7, making each such soldier a match for almost 8 untrained, unarmed men. There are then moderately complex calculations to determine how many troops are lost, how much equipment is destroyed in the battle, and so on. These involve factors ranging from the materials from which the equipment is constructed (for loss factors) to the tactical and strategic considerations of the battle (for personnel losses and victory determination). The Referee is supposed to perform these calculations, and then provide her players with the results in a more narrative form (though the results in numerical terms should also be provided, to whatever degree that they would be available to the players' populations). Other factors covered in the game include agriculture and animal husbandry, mining and prospecting for resources, lumbering, and so on. 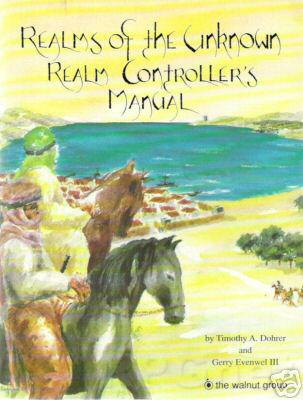 There is a surprising amount of information covered in the two published volumes (the Player's Manual of 24 pages, and the Realm Controller's Manual of 82 pages, including index). Some of the data given I don't particularly like, myself. For instance, a unit of metal is defined as approximately a cubic foot of the material (in most cases, hundreds of pounds; for instance, a cubic foot of iron weighs about 490 pounds), while produced items take up a surprisingly large amount of the materials (a pair of Longswords, according to the rules, require all 490 pounds of iron in a unit to construct). While a certain amount of loss should be expected in manufacture, the fact remains that a Longsword weighs less than 5 pounds, making the losses in the range of 98%! Anyway, the idea of the game is really good. There are additional rules covering technology levels, specialists (people who have advanced skills that normal people can't perform, such as Engineers or Military Commanders), population morale and health, economic strength, and other such important considerations. Various sections include more advanced (and bookkeeping-intensive) variations. There is discussion of general physical traits of populations (so that, for instance, it would be difficult to infiltrate a spy into the upper command of a racially homogenous society that appeared different from one's own people, meaning that it would have to be more indirect, such as hiring a traitor from that population to do so). There are, however, no rules for magic, other than some notes about interplanar gates between Realms, and a note that the individual Referee could include magic if she wishes. There are some useful logistical notes, such as what to do if a player needs to take a leave of absence from the game (the player should give a general outline to the Referee and let her run the population for the time of absence), how to coordinate multiple Realms connected by gates, and so on. Like early D&D, there is much that is unexplained, much that is confusingly explained, and much that could (or even should) be house-ruled. It is, like the LBBs, a glorious mess of a game. It should have gotten more exposure, but more traditional adventure-based role-playing games were pretty strongly entrenched by the time this one came out, and players had become accustomed to more well-written and "complete" games. How would I run it? First, I'd scrap many of their precise numbers, replacing them with factors taken from (mostly) GURPS Low-Tech and supplements, or from other games such as Chivalry & Sorcery or Pendragon that have detailed domain management rules. I'd probably replace the mass combat system with one derived from one of these other games. Other than that, though, the basic framework seems really good. It might even play better online, as a sort of play-by-email type game, with a central website providing publicly-available news about game events. After I do some other things, I might even try it. Sounds like the sort of game that would be enhanced by the use of a spreadsheet and which probably got sideswiped by Real Time Strategy computer games, back in the day. Also sounds like the sort of campaign game I would have loved as a teen with all the fiddly bits and obsessive book keeping. I think that you're probably right about RTS games taking it over, and also that a spreadsheet would probably really help a lot. Depending on how exactly it is run, the players might not really have to deal with numbers much, but the Referee would be forced to take up a lot of slack for numbers not given to the players. On the other hand, the numbers could be given to the players and reduce the Referee's workload a bit. I picked up this game when it was first released, created a game world, and convinced three friends to play. After a week of play, real life got in the way and the game kind of dissolved. I still have my original books, maps, and player information. It is a complex game that begs for some sort of computer moderation yet is so open-ended that it needs a referee to decide on the effects of creative player actions. You are right, this game is perfect for PBEM. Unfortunately, it came out in 1991 when e-mail still rare. A pdf version of the Player's Manual was later created in 1997 and is now up on Scribd. Thanks for pointing out the pdf of the Player's Manual. I'm pleased that other people managed to get a game of this going. I tried twice, but the first time the game didn't get much past the first couple of days before the players decided to concentrate on another game (and their jobs, the bastards) which was more traditionally adventure oriented. The second got as far as making up player sheets, but due to other life concerns we never got to actually play. Ha! I forgot that the CCG Monster came out at the same time. Yeah, that would pretty much kill anything that got in its way. Glad that you could stop by, and glad that I could help let you know that the game is still in the hearts of some of us out here. I would love to see an update (I'd be willing to offer my own comments in more detail, if you want!) of the game. Glad that you enjoyed the review! It would make a good computer game, though such a thing would be inherently more limited than a Referee-moderated game. A program or app (or even just a spreadsheet) that tracked all of the data needed in the game would be a really useful tool. The question would be if it could be made to compete successfully with RTS and 4X games. Yeah, I just know Gerry as a 'Spread Sheet' kinda guy, big with EVE online and the like. Seeing you identify it as such was a bit funny knowing that it can be identified in his work as well. As far as we have talked on the matter, the question of developing it into a game has really extended past the manuals topics. It would be more of integrating multiple worlds through the inter-dimensional concept already established. Thus, making it a much more connected playerbase, much more expansion/exploration, and might also call for games within games on what the effects of that community might entail. That sounds very interesting! I hope that you can move forward with it. Every few months, I start to think about running a PBEM campaign of it, and maybe one of these days I'll actually follow through!